The previous golf tournament websites (all developed in Convio, now Blackbaud Luminate) were mostly forms pages with white text and some branding. 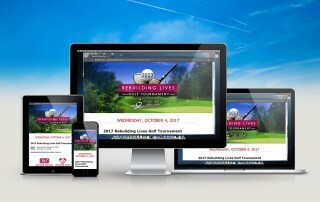 Some of the challenges were how to make the websites more exciting, more of captivating the event’s spirit and making it mobile-responsive, so that donors and sponsors can respond quickly with their transactions, rather than waiting until they get to a desktop computer. We decided to take a very illustrative approach and create imagery that shows the fun side of golfing, as well as creating an an easy experience to make a donation or sponsor the event. Creating mobile-responsive websites in Luminate can sometimes be a challenge, as in some cases, a number of CSS and PHP files need to be tweaked in order to make the website mobile-friendly. The result is a website that helped increase more donations, at different times of the day, while giving the experience and spirit of competitive sport and family-friendly fun and fellowship.